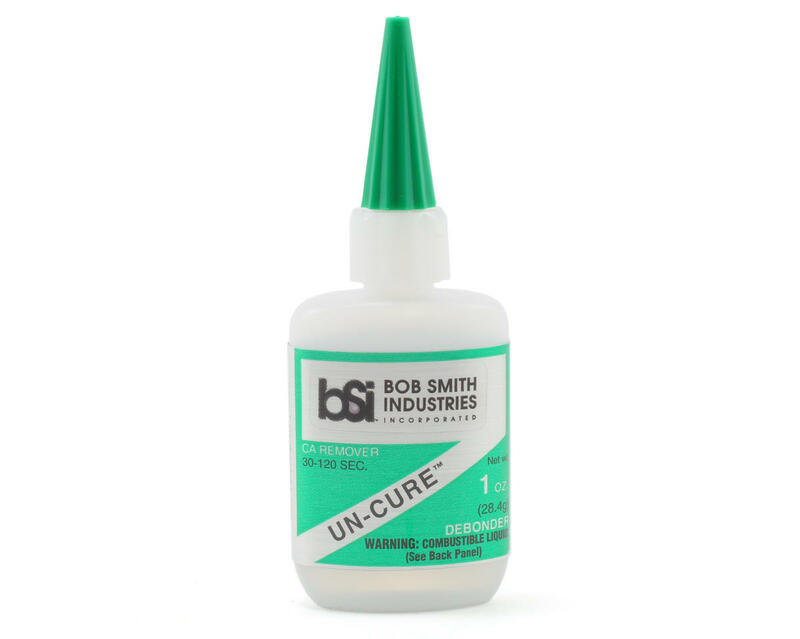 This is a one ounce bottle of Bob Smith Industries UN-CURE™ CA Debonder. UN-CURE™ Debonder will soften cured CA. If parts are bonded incorrectly or your fingers are stuck together, a few drops of UN-CURE™ will dissolve the CA in about a minute. Apply on bonded skin and roll apart fingers. Once stuck, use acetone to clean off softened CA, then wash off with soap and water. I had been using Losi debonder for about a year and decided to try this as a cheap alternative. It works almost instantaneously. I worked four tires in five minutes compared to the hour or two using the Losi stuff. Just don't get it in a cut. Highly recommended! I tried this stuff to debond tires and it took a hole bottle and 4 days to debond 1 tire. I thought this stuff was complete waste of time and money.